DVDs are fragile. Official statistics show about 20% DVDs are subject to loss, 19% discs vulnerable to scratch, 5% DVDs covered with fingerprint, 5% suffering from data loss, leaving half under breakage. Such issue sets the stage for the booming of DVD ripping software. Given that countless customers asking for the truly best DVD ripper regarding to the DVD ripping speed and output quality they concern most, we've sought out the top rated DVD converters with their basic functions, easiness, bonus features, speed and quality all explained. Note: Before we go ahead with the best DVD ripping software review, you shall bear in mind that DMCA forbids bypassing copy protections on commercial DVDs. We just provide the top-rated software of 2019 to rip files from your DVD for personal use rather than endorsing piracy or other activity against laws. 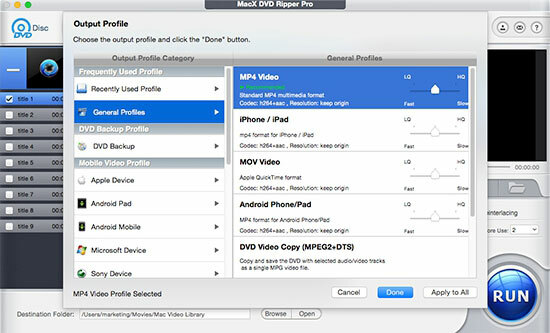 MacX DVD Ripper Pro (or Windows version) is so far one of the most invincible DVD conversion software for Mac (Mojave) and Windows (10) simple because it sidesteps the sophisticated copy protection on newly released DVDs and has no problems ripping DVDs from Disney, Warner Bros, Paramount and Sony. It allows you to get the movie content you want to watch in the format you need, e.g. rip DVD to MP4, MOV, AVI, WMV, MPEG4, H264, MKV, ISO Image, MP3, AAC, etc. The infused 350+ preset profiles make it much easier to work with. Whether you want to play DVD on iPhone 6s/Plus, iPad Air 2, or convert DVD to Android Samsung HTC, Windows phones, blackberry devices, Google Chromecast and even Sony's PS4, this best DVD ripper for Mac works at desired results. It crowns the top list of best DVD ripper 2019, which is never groundless but based on software test and editorial rating. Tests with an iMac 5K sporting a 3.5 GHz Intel Core i5 processor and 8GB of RAM saw it took under 10 minutes to rip the feature-length movie Finding Dory from a DVD to MP4 MPEG4, yet compressed the film into a much smaller file size 1.5 GB. The results are impressive, with virtually indistinguishable video/audio quality from the original DVD. According to MacWorld review, "MacX DVD Ripper Pro works at its highest quality settings but fastest speed or sacrifice a little image quality for a faster rip - or anywhere in-between. Please note the speed depends on several factors, such as the DVD length, output format, settings, the CPU processor and the computers specs like processor and RAM. 1. Conquer all DVDs standard or not, like 99-title DVD & workout DVD. 2. Remove various DVD protections, like CSS, Region Code, Sony ARccOS, Disney X DRM. 3. Provide intuitive and straightforward UI for beginners yet furnish bonus features like movie editing, hard/soft/force subtitles adding, parameter settings for advancers. 4. Output movies in a wide range of formats and convert DVD to 400+ mainstream devices, be it iPhone 7, iPads, Galaxy S7, Surface Pro 4 or PS4. 5. 36X real-time ripping speed and no quality loss. Cons: MacX DVD Ripper Pro lacks the ability to burn new DVD discs. This is a powerful Mac DVD ripping software with interface that is simple and easy to understand. This is also one factor in the best DVD ripper 2019 review. Tests shows Magic is able to rip a DVD within 1-2 hours and output the movie size over 3 GB, poor performance in DVD file compression. With 8 video format options and 15 phones and tablets choices, you can easily rip protected DVD to AVI (Xvid, DivX), WMV, MP4, MPEG2, MP3, VCD or SVCD and convert DVD to iPod, iPad, PSP, PS3, and other gadgets with easy. Magic DVD ripper makes it the best tool because it is available for you to rip disc image file or the raw video TS folder so as to burn a new copy of your DVD using a third-party burning tool. Pros: This tool allows to backup ISO image and video TS folders as well. Cons: It has tiny library of customization profiles and lacks video editing tools compared to other software. DVD Decrypter is an open-source yet best free DVD ripper that has the knack for ripping a DVD to a folder in the form of VOB and IFO files or ISO image. It tops best DVD converter list since this program tears through pesky copy protection and touts all the advanced settings under cover in the menus. Despite DMCA outlawed this best DVD decrypter software since its final version 3.5.4.0 and its official website was shut down due to some legal issues, it is still one of the most popular free DVD ripping solution that even helps to split a ripped ISO file into 1 of 17 sizes. Speed is really fast since this program only saves DVD movie in VOB or ISO image. Pros: Best DVD copy software to bypass encryptions before creating backup copies of protected DVDs in VOB or ISO. Cons: Unable to deal with the latest DVDs with new copy protections. It sometimes cannot cope with Disney 99-title DVDs. DVDs released after 2005 cannot be successfully decrypted. 1. DVD converter is slow when ripping most latest DVDs. 1. Sometimes it cannot open files and get errors "cannot recognize DVD". 2. Subtitles show up for a slip second and disappear. 1. Some DVDs are unsupported. 2. Get errors such as I/O, Access violation, failed to set data, section read error, etc. 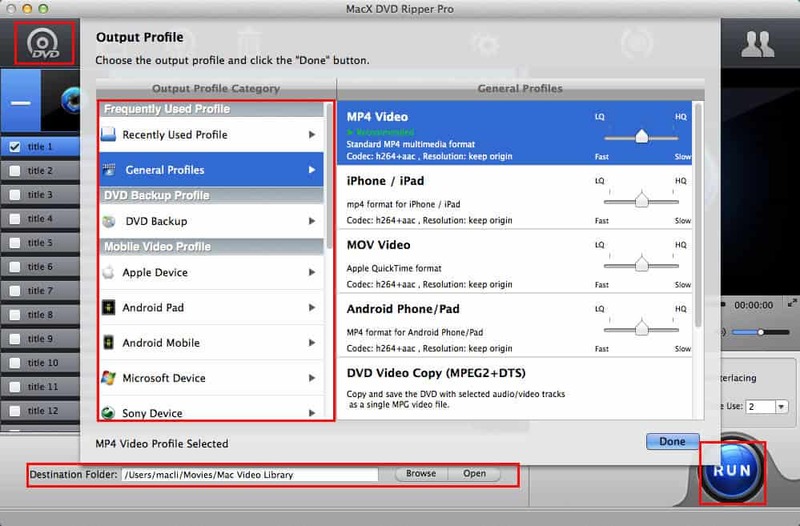 Try MacX DVD Ripper Pro to painlessly rip latest DVDs, 99-title DVDs, workout DVDs, Japanese DVDs, unplayable & damaged DVDs and more to MP4, MOV, AVI, WMV, MPEG4, MKV, etc. with no.1 fast speed. Actually, there are still many other DVD ripping tools for Mac/Windows claiming the best like Handbrake, Mac The Ripper, Open DVD Ripper and more. The above mentioned three software are just based on customers feedback, tests and editorial reviews. 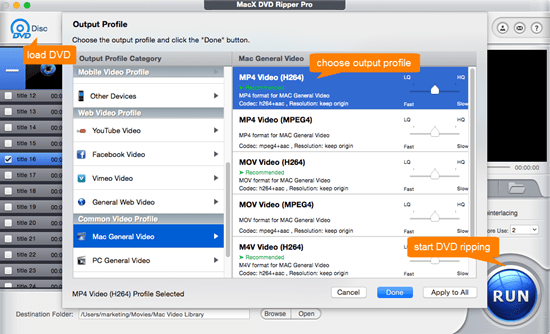 If you pay much attention on speed and output options, then MacX DVD Ripper Pro is superior to the others. In case you focus on the decryption ability, MacX DVD Ripper Pro and DVD Decrypter edge out. Given that you care more about input options, MacX and Magic are more favorable. It's just up to you to take one as your best DVD copy software in 2019. For a detailed guide about DVD rips, please scroll down. Step 1: Free download the program on your computer (you can also get the Windows version on PC), install and run it. Hit the "DVD Disc" or "DVD Path" button to import the DVD, ISO image or DVD folder. For a protected DVD, this DVD copier will automatically choose the right title for you. Step 2: Select the output format you desire once a drop-down window pops up. You are allowed to copy DVD to ISO, MKV, MPEG2 and rip DVD to MP4, MOV, AVI, FLV, WMV, iTunes, and more. The preset profiles are ready for you to directly convert DVD to iPhone, iPad, Android, Game consoles, etc at your fingertip. Step 3: Click the "Browse" button and choose the destination folder to save your ripped file. Step 4: Click "RUN" to start ripping DVD to your hard drive. Hot tips: after you rip DVD with the best DVD ripper on Mac or PC, you can transfer them to iPhone iPad to watch on the go. Movies from computer to iDevices via iTunes is quite complicated, and you can switch to easier option with MacX MediaTrans, which brings an one-click data transfter between computer and iOS that enables you to easily add movies to iPhone X/8/7/7 Plus, iPhone 6S/6S Plus/SE, 6/5S, iPad, iPod (iOS 11 supported) and vice versa. This guide on how to copy a DVD on a Mac tells you how to copy protected/homemade DVD movies on MacBook, iMac 5K, Mac Mini etc (El Capitan/Yosemite) to hard drive, DVD, mobiles with fast speed and high quality. Hanker for DVD copy software for Mac to make backup copies of your DVD collection? The roundup of top 3 DVD copiers for Mac (10.13 included) will illustrate various copy options, pros and cons before you free download it and copy DVD on your Mac OS X.